Pictured Above: Proof that the Flash can outrun Superman, and thus the Springfield Monorail. That said, MKvDC is a widely unbalanced game. Superman can ground pound indefinitely so he never loses, and the Flash has an infinite combo as well. 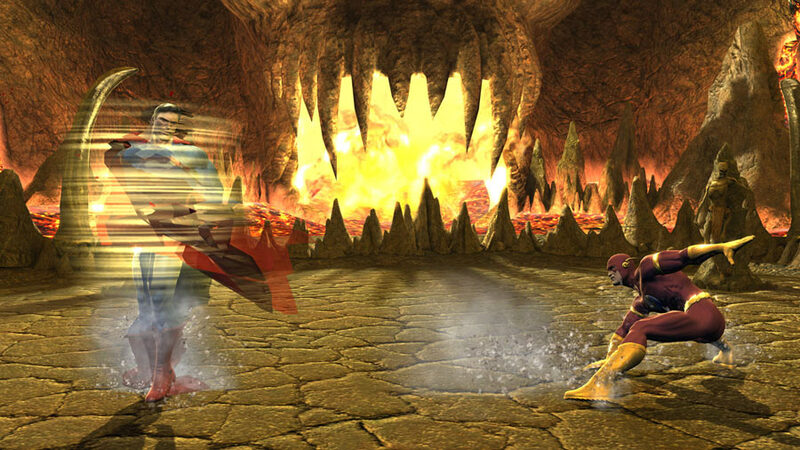 When I competed online at the game’s initial release, I was dismayed to find the Flash was considered a “dirty” character to use and some people will refuse to play against him. Technically, it fits his character concept: the Flash is so insanely more powerful than someone like the Joker that it should be illegal for them to fight each other. Subsequent patches and DLC could’ve fixed these problems, but the developer filed for bankruptcy in 2009 so those plans were scrapped. I really like the Flash in this game, so I’m very dismayed it doesn’t have very much longevity or replayability. In the end, my criticisms of this game as a whole are very similar to Justice League Task Force. Its storyline is weird, its characters are unbalanced, and there is no palette swap of the Flash as the Reverse-Flash, Blue Lantern Flash, or the Dark Flash. I mean, a Mortal Kombat game without gratuitous use of palette swaps? It is the biggest sacrilege in video game canon I can think of, in a world where Scorpion, Sub-Zero, Reptile, Smoke, and Ermac are so notoriously popular. We’re just left with an oddity of video game history: a Teen-rated Mortal Kombat where (insert DC character) can fight (insert MK character). I can forgive the use of “Heroic Brutalities” and T-rated fatalities in general, but not the fact that this was our best chance to see the Black Flash perform superspeed fatalities. With this short review of a big studio game in mind, let’s turn to a purely fan-made project: the Flash as he’s available in MUGEN. Pictured Above: Your eyes do not deceive you. 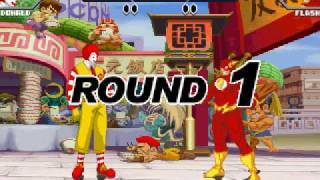 The Flash is about to fight Ronald McDonald in the restaurant stage from Pocket Fighter. One of the most bizarre things you can find in the Weird Part of YouTube is this video called “Everyone Hates the Flash.” It doesn’t showcase the Flash as a playable character in MUGEN. Instead, it’s got the Flash falling victim to a plethora of other character hyper combos. I guess he was selected at random for it? Just one of those bizarre things people will do with too much time. The Flash as a character in MUGEN is pretty neat though from what I’ve seen. Here is a video demonstration of some of his moves. There may be hundreds of different versions of him floating around the Internet and peoples hard drives, however, so each version may vary from one to next in terms of quality. From what’s available, his animations and moves look crisp and “speedstery” enough. He’s got the motion blur down, some teleport-dash styles moves, rock/tornado projectiles that fit with his concept, and some neat looking hyper combos. To see him in action, here is video of him fighting Pingu the Penguin. Thanks again, YouTube! 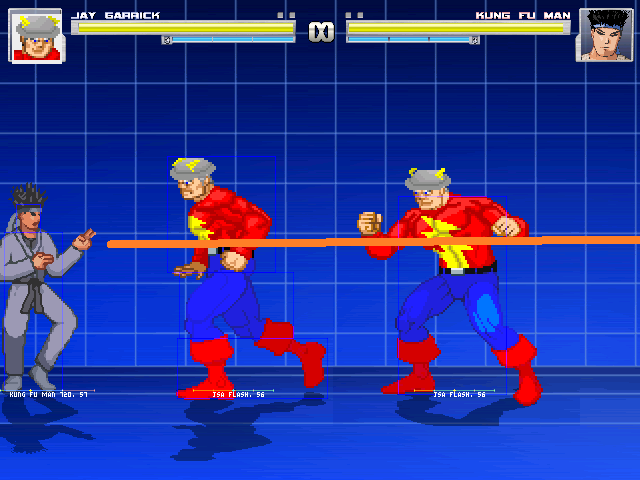 Pictured Above: Even Jay Garrick gets some love as a playable character in MUGEN. What is there to say? If you really need to have a four-way deathmatch between the Flash, Peter Griffin, the KFC Colonel, and Waluigi, it’s available to you through MUGEN. The Flashes available are pretty good for just a fan’s labor of love. Now, if someone combined the Flash MUGEN character with a playable Captain Cold, Trickster, Weather Wizard, and Gorilla Grodd, etc., then we’d be on to something. Previous articles in this series include Part 1: 90s Handhelds, Part 2: Earth’s Final Defense and Part 3: Justice League Task Force.